The Studio of Jonathan Sherman offers several different options for study: individual private lessons, understudy as a pupil, periods of intensive study, apprenticeships, and art enthusiast education. Studio apprenticeships are offered at reduced rates but require greater commitment. Please contact the Studio if you are interested in learning about holding an apprenticeship position. The opportunity for an intensive period of study is a magnificent way for one to sink into a particular area of knowledge while receiving daily guidance from Jonathan. These periods are unique to each individual as the area of interest and level of ability vary. The time and approach are completely designed by the individual and Jonathan. Rates for intensive periods of study vary and are based on weekly or monthly time frames and costs are reduced to accommodate this duration of study. Please inquire if this course of study is of interest to you. An opportunity for non-Artists to come into a working studio and learn about how oil paintings, drawings, and sculptures are made. Sessions are intended to expand individuals' appreciation when viewing works of Art in public, galleries, or museums. To schedule a lesson, contact the Studio by telephone at (781) 502-8822, by e-mail or via the form below. Studio lessons are held during the morning, afternoon, and evening. The Studio of Jonathan Sherman is committed to assisting aspiring Artists in their process of artistic development and is prepared to help through all of the stages of one’s development: the acknowledgement and acceptance of talent and artistic gifts; the establishment of a foundation of seeing and observing the physical world; the cultivation of mastery over a range of skills in various artistic mediums; opening to and communicating with the Divine; and the management and conducting of oneself as a professional Artist. The Studio's unique teachings provide individuals of all ages with the necessary knowledge to assist in facilitating one’s own authentic Artistic expression. Once aligned with one's Divinity, the world opens itself up, and one may begin to access a wealth of creative energy, knowledge, and techniques which will aid in the creation of works of Art. 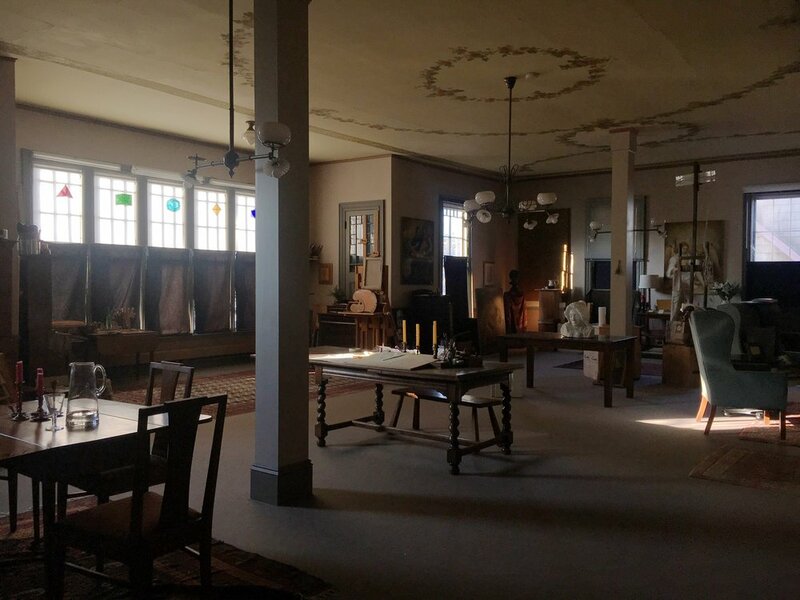 The 1,600+ square feet of working space is flooded with North light and is equipped with all of the necessary tools for artistic training in the areas of drawing, oil painting, and sculpture. All of the tools and equipment that students use are the same as what Jonathan uses to create his works of Art, allowing for great familiarity and ease when demonstrating or communicating about their usage. The single factor that makes The Studio of Jonathan Sherman unique is Jonathan's ability to channel the Divine and bring Divine guidance in addition to his own personal experience to all Artistic situations. Working in this way, allows students the opportunity to familiarize themselves with their own innate Divinity and the process of creating in alignment with the Divine. All meetings with patrons and management of the Studio's business also take place within the space transparently so that students may begin to experience Jonathan and Elizabeth's unique approach to the handling of the Studio's business affairs. The cornerstone of artistic training at the Studio is the thorough cultivation of knowledge of what we refer to as, the building blocks of the physical world; shape, form, proportion, light, shadow, contrast, texture, rhythm, and harmony. It is fundamental to see and truly appreciate the structure and the subtle magic that is the visual experience of physicality. Observational language, a system developed by Jonathan, fosters an individuals ability to systematically break down through clear conscious observations the physical nature of an object, is focussed on early in ones training. It helps provide an organized way for one to visually familiarize themselves with the essential aspects that comprise the whole of a particular object. Various drawing techniques and mediums are used to assist in the development of this skill. Through mastery of the faculty of drawing as it is fundamental to truly appreciate the structure and subtle magic of the visual components of the physical world if one wishes to create and express through this language with their own Art. The studio offers thorough training in the many aspects of the craftsmanship of oil paintings; tools and brushes, hand made pigments, application and usage, oil based mediums, varnishes, and canvas preparation. A well-crafted oil painting is able to last over a thousand years if cared for properly. The medium of oil paint allows an Artist to utilize the entire range of values and colors that are visible to the human eye in nature. With thorough knowledge of this one is able to present compositions with a natural feel, thus evoking responses within the viewer as if they were true to life. Tonal and color harmonies are essential for the presentation of a unified vision. Knowledge of form may be most beneficially explored by working with the three dimensions directly. The studio provides the opportunity for the study of form through working with clay. Its ease of workability makes it the perfect medium for individuals to begin to pursue the construction of three-dimensional solid forms. After experiencing these forms with the hands, the mind has an easier creating the illusion of them with tone on a two dimensional surface such as a canvas or piece of paper. Sculptures that are created in clay that wish to be preserved are able to be cast at a local foundry in bronze, plaster, resign, or stone. Magnificent works of Art do well when they are presented magnificently! We help individuals learn how to frame pieces, matte drawings, complete original french matting, and gold leaf flourishes. Thorough discussions are had in ones handling of their own presentation to ensure that it remain harmonious with the level of the Artwork through an Artist's bio, Artist's statement, business cards, website, social media networking, and physical presentation. All of our contracts for our commissions are shared with students so that they may learn to enter into engagements with clarity of terms and copyrights. Jonathan is available to give lectures, lessons and consultations outside the Studio. Schools, museums, and athenaeums are venues which are particularly conducive to the nature of his work and teachings. Please visit our Contact page to get in touch.